Maps can be simple tools, comfortable in their familiar form. Or they can lead to different destinations: places turned upside down or inside out, territories riddled with marks understood only by their maker, realms connected more to the interior mind than to the exterior world. These are the places of artists' maps, that happy combination of information and illusion that flourishes in basement studios and downtown galleries alike. It is little surprise that, in an era of globalized politics, culture, and ecology, contemporary artists are drawn to maps to express their visions. Using paint, salt, souvenir tea towels, or their own bodies, map artists explore a world free of geographical constraints. Katharine Harmon knows this territory. As the author of our best-selling book You Are Here, she has inspired legions of new devotees of imaginative maps. 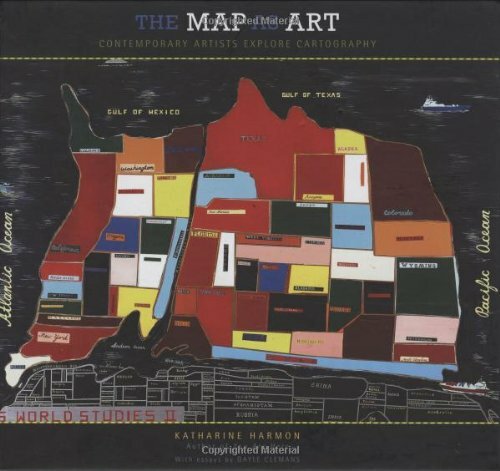 In The Map as Art, Harmon collects 360 colorful, map-related artistic visions by well-known artists—such as Ed Ruscha, Julian Schnabel, Olafur Eliasson, Maira Kalman, William Kentridge, and Vik Muniz—and many more less-familiar artists for whom maps are the inspiration for creating art. Essays by Gayle Clemans bring an in-depth look into the artists' maps of Joyce Kozloff, Landon Mackenzie, Ingrid Calame, Guillermo Kuitca, and Maya Lin. Together, the beautiful reproductions and telling commentary make this an essential volume for anyone open to exploring new paths.